Cabin, 4	Bedrooms, 3 Baths, sleeps 11. Comfy Stearns/Foster mattress'. This rustic house is located on a very quiet, level street in Tahoe Donner. This cabin is cozy, warmly furnished, and brightly lit with natural light from dawn to dusk all year. The interior has been freshly painted last fall. The master bath boasts a newly tiled shower, countertop and double sinks. The kitchen a new double wall oven and refrigerator. The remainder of the house has up-graded professional designer touches throughout. New windows and doors make it super energy effecient for you. The house sleeps 11 and is 2252 sq ft. There are 4 bedrooms, 3 full baths, plus both a recreation room and living room. There is an attached 3 car garage with additional level driveway parking for 6 more cars or your boat. equipped kitchen (coffee grinder and maker, kitchen aid stand mixer and attachments,blender, food processor,toaster, waffle iron, plus full supple of pots/pans and utensils, measuring cups/spoons.) Dining service with glasses, plates and utensils for up to 12. The living room has a new flat screen TV with a DVD/VCR combo for your enjoyment, as well as a stereo / CD player with surround sound. There is an eastward facing deck out the dining and living room. Great for BBQ's, early morning coffee, or star gazing over the tree tops at night. BBQ is provided on upper deck. Downstairs you wil find a large rec room with a Queen futon and several couches for relaxing. The rec room is also home to a new 60' flat screen TV with blue ray player with enabled Netflix streaming for unlimited movie viewing . The TV is also cable and DVD ready. This room also has a brand new computer/monitor to help you keep in touch or browse the web. For additional entertainment try playing the Casio 1-2-3 player piano~ fun! And just so you don't have to keep running upstairs for a cold drink, their is a small refrigerator. The deck off of the rec room is for total lounging comfort. Youl'll find a hammock, and two hammock swing chairs . This area is totally shaded for a quiet yet cool summer escape. There is also a bedroom downstairs with Queen bed that boasts of a Stearns and Foster pillowtop mattress guaranteeing a great nights sleep; and a full bath downstairs as well. The upper level has 3 bedrooms. One bedroom has a 1 twin and a bunk bed. The second bedroom has 2 twin beds. We also have a fold-away portable crib, in case you are bringing 'little ones'. The Master suite boasts a comfy Stearns and Foster pillowtop mattress in king size with a 46' flat screen TV to watch. The Master bath is newly tiled for a spa like feel. New pillow top twin beds have down comforters encased in flannel duvet covers and rustic quilts on top for great snuggling down after an active day.There are doors to the front deck out of both the master and the double twin bedrooms. There is also a laundry area with washer and dryer, and a full bath at this level. We supply all your linen needs for bed and bath! This cabin is a tri-level with a deck off of each level. There is an outside patio table and chairs for a summer to fall BBQ. Access to nearby Trout Creek recreation center with its heated pools and spas. Gym, sauna, massage center,and work area available with your provided guest passes. Access fee is $8/day with use of our guest passes. 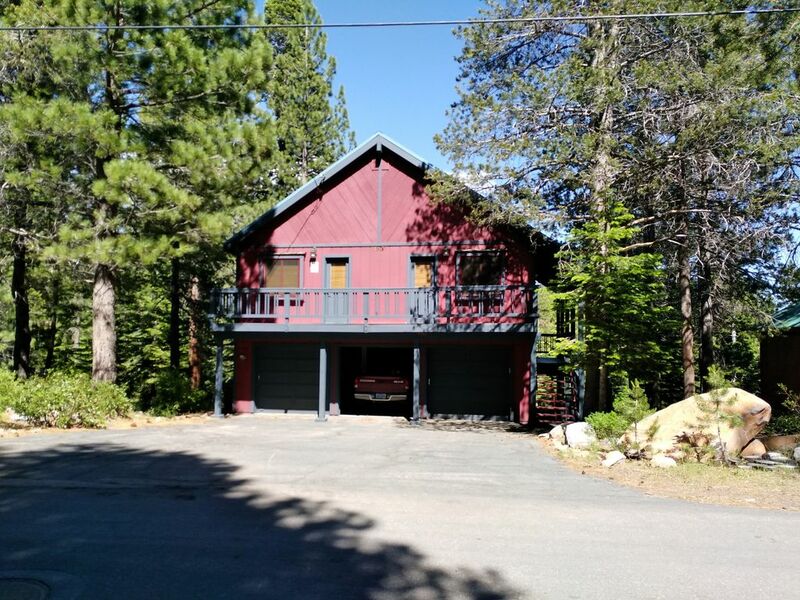 The house is located in Tahoe Donner making it short 5 minute drive to historic downtown Truckee. Skiing, snowboarding, sledding and snowshoeing are all availalbe in Tahoe Donner! Drive a short 15-20 minutes and find yourself at Northstar, Squaw Valley, Sugar Bowl, Boreal and Alpine resorts. Summer activities can be enjoyed in one of the pools, spas, or on the private access beach of Donner Lake. Take the boat out, fish, raft or swim at Donner Lake, Lake Tahoe or in the Truckee river. Take a tennis lesson or horse back ride down a wooded trail. Play golf on one of the nicest greens surrounded by towering pines. Stroll downtown to shop and dine, or hike and bike (we've left you four...one adult size 'girl' bike', on adult size 'boy' bike and smaller 2 wheelers for a girl and boy.) on one of the many trails in and around the area. After years of enjoying all this mountain community has to offer, my husband and I splurged on our dream and purchased this home. We love the fact that its on a quiet inside street and only a few houses from a hiking trail head. It's rare when you don't see some wild life in the evenings heading down to the wetlands for a drink in the evenings. We've watched young fawns grow into their antlers, beavers coming out at dusk to build, the raccoons scamper, and even a bear or two lumbering, not to mention all the chipmunks, jays and woodpeckers! Skiing, golfing, swimming and more are within minutes of the house. And trails to hike or bike are numerous. When we feel like taking it easy, the hammock out back is where we 'hang'. (Sorry, couldn't help myself.) All, in all, if you enjoy the quiet of the hill, yet want plenty to do this is 'THE' place! We stay here often, so we have added many amenities over the years. When ever we have one of those moments that say to you..'Hey, you know what we should get for the cabin?' We go out and get it, so you won't be looking for this or that to make your stay comfortable and homey. When ever the house is seasonally vacant we are cleaning, updating and performing maintenance for you to enjoy comfort, clean and cozy accommodations. You will find top of the line mattresses to sleep upon. We've supplied you with a kitchen fully loaded with every appliance to make your experience in the kitchen fun There are 3 flat screen TV's on the property, (The largest in the family room and 60'). There is wifi for your computer, and a Casio player keyboard. We've left DVD's and videos and board games and books. The house has cable, Netflix, land line phone for local calls (Think snow storm and mts. and your cell may not work here.) We also provide a snowplow service to be sure you get in and out of the driveway in winter. Additionally, there are garage door openers to let you in if the weather is stormy. This house also has 3 car garage, plus ample driveway area for parking up to 6 more vehicles or your boat. Upon entering you will find a large, cozy inviting living room opening to the kitchen, dining room and large deck overlooking the forest. The kitchen has a new refrigerator and double wall oven in addition to everything you need to cook and serve 12 people. The living room also boasts a real wood burning stove for those chilly nights. The house also 'splits' easily to accommodate two families. With one family sleeping 'upstairs' where there are 3 bedrooms. A master suite with a newly remodeled bathroom, Foster and Stearns king mattress, front deck closet and dresser for storage and flat screen TV for some quiet time. The second bedroom has 2 twin beds and access to the front deck. The third bedroom has a bunk and a twin. There is also a full bath on this level. Downstairs there is another master with the same great mattress in a queen, full bath, family room with large screen TV, mini refrigerator, fold out queen futon and deck area. It's great to be able to share common area of the living, yet separate to settle in for private time in the evenings. We have made certain that all the mattresses are top of the line, linens are comfy and down comforters are on all the beds. You'll find big fluffy towels in the bathrooms. The kitchen is fully stocked with appliances, dishes, flatware, and serving pieces. There are 3 TV's, WIFI, VCR, CD players, extra chairs, pillows and blankets. Forced gas heat for convenience, but a cozy wood stove for ambiance. If the weather is warm, there are some bicycles and helmets in the garage for you to use! The cabin literally has everything you need waiting for you...including extra toothbrushes just in case! Lastly, the driveway is almost flat! Yes, easy in and out in bad weather. Our house has a 3 car garage with door openers, something you'll really apppreciate in wet weather. Enjoy all the Tahoe Donner amenities with our guest passes during your stay. Cabin backs up to 2 mile wilderness loop trail. Head out at dusk to see animals come down to the wetlands for a drink, or watch the beavers busily at work. All bed linens provided. Down comforters and quilts on beds. 3 car garage. Parking pad for 6 cars. Guest pass to Trout Creek activity center. Open concept. Opens to back deck. 2 refrigerators in the cabin. Standard refrigerator with ice maker in kitchen, and small apt. size refrigerator in Rec room. Double wall oven with over 10 cubic feet of cooking interior space. Large Pantry with lots of space for food items. Seats 8 at the dining table. 2 at the kitchen counter and 4 at the table outside. Library available at TD information center in addition to books in our Rec room. We have left you cards and multiple board games. We have left some fun activities for a variety of ages. Boat rentals available at Donner Lake, or bring your own boat and launch off our private beach access at Donner Lake. 4 decks. 2 on the East, one on the west and one south facing. Ski resort 2 miles. Multiple others within 20 miles. 2 Golf courses within 1 mile. Community center has one for you to enjoy. 2 pools. One open year round. Both outdoors. Community center has 2 that you have access to. Sleeps 11 4 bedrooms 1 King-upstairs master (New pillowtop Stearns & Foster mattress) 1 Queen-downstairs bedroom (New pillowtop Stearns & Foster mattress) 2 twins -upstairs bedroom (New plush top mattress) 1 twin+2 twin bunk -upstairs bedroom (New plush top mattress') 1 portable fold-away playpen 1 Queen futon in rec room 2 Twin Tri-fold 3" deep floor mats 3 full baths (hair dryer in all 3 bathrooms) Living Room (upstairs) Recreation room (downstairs) 4 decks :tables/chairs/hammock-summer Free wireless internet access Free local phone service 3 New flat screen cable ready TV's (60", 46', 40") ,DVD, VCR and Stereo (Rec room/ living room/Master) Rec room has a new flatscreen 60" TV with Blu ray player and is Netflix streaming enabled for unlimited movie viewing of over 30,000 titles ASUS computer with free internet-Windows 7 Casio 1-2-3 player piano. Additional small refrigerator in family room. 5 bicycles/helmets Books, magazines, movies, CD's and numerous child/adult board games Beautiful, fully equipped gourmet kitchen Opening and closing service included. House is warm and water is on. Laundry - washer and two dryers, clothes line High quality linens and towels provided Kitchen and bath paper/cleaning products provided All beds have cushy warm down comforters wrapped in flannel with rustic quilts All bedrooms have iPod alarm clock/radio docking stations New 46" flat screen TV in the Master bedroom New 40" flat screen TV in living room with VCR Level street with slightly sloping drive. 3 Car Garage plus driveway parking for 6 additional vehicles Snow plowing during winter of driveway is provided Tahoe Donner Association is located in the town of Truckee, CA. The Association manages two recreation centers offering many amenities exclusive to residents and renters. Tahoe Donner winter amenities include its own ski and snow play area, cross-country skiing, 3 heated pools (one of which is open ALL year! ), several spas, sauna, steam room, and complete gym. Massages are also available. The recreation centers are located within a 5 minute drive, or just walk on the trail behind the house. Access fee is $8/day with use of our guest passes. In the summer enjoy Tahoe Donner's golf course, driving range, equestrian center, tennis courts, and hiking trails, pools, gym, beach, and much more. One of many trail heads is just a few doors down from the house. At nearby Donner Lake there is a private boat launch, beach and concession area for your use. We had a great stay here and everyone had plenty of space. Loved the location in winter- skied Donner and used the guest passes for the reccenter. Beds were super comfy and downstairs room and space for kids was great to have. Only reason for 4 stars was because we couldn’t get hot water for showers and the kitchen needed a few more upgrades. Also- pack body soap/shampoo, any spices and oils needed for kitchen as these aren’t provided. But overall, Kathy was a great host and has the cabin set up perfectly for guests. There were 11 family members who decided to get away for the Thanksgiving Holiday. Kids, moms and dads, a set of grandparents and two dogs. The youngest celebrated his 9th birthday on Turkey Day. The fact that it snowed during the night was unbelievable. We woke to the sound of snowplows in the area. The house was warm and inviting. Wonderful views of snow filled trees. Everything we needed to cook our turkey dinner was in the kitchen (from coffee pot to plates, coffee cups to bowls, silverware, you name it!) and the number of beds and bathrooms was just right. We would love to visit again. Would love to have you back whenever you want to come to the mountains. My family of 8 (plus two puppies) stayed over the 4th of July week and had a blast! The cabin is HUGE! Everything about it was great. The kitchen , the TVs, the couches and beds, and the hammocks!! I will definitely be coming back to this little slice of heaven in the best town in California, Truckee!! We totally loved this property. It was amazing! We had plenty of room for everyone and it was very comfortable for all. The porches were so wonderful and had us spending time relaxing in the outdoor space. It was very well set up and clean. We loved it. Hope to come back again. We hope you can come back at some time in the future and visit us again too. I love it the most in the fall, when the air is crisp, just before winter sets in. We had a great stay with 3 young kids. The kids loved the electric piano and the hammock. The Tahoe Donner pools and beach access were outstanding the the hike right behind the house was great. We had to call the owner once for a quick question on turning on the fan (it was really hot the week we were there) and they helped us right away. Would definitely stay there again! Thanks for your glowing review! So glad that everyone enjoyed the cabin and ourTahoe Donner amenities too during your stay. Hope to see you back soon, every season in the mountains is different and worth exploring. This is a beautiul, clean, well maintained trilevel house on a quiet street. It has 4 full bedrooms and 3 baths. Kitchen has many appliances including a bread maker. The owners are honest and easy to work with. Always answered e mails promptly. You can't go wrong with this one. Just bring your slippers because you don't want so soil their nice carpets with mud or snow. Thanks so much for your kind words. We like to treat our guests like family, and our family like guests. Glad you enjoyed the cabin as much as we do. There is so much to do in the Truckee Tahoe Donner area year round. Any season offers the best of the great outdoors. Northstar, and Tahoe Donner. In addition to the Tahoe Donner ski area, for non-skiers/boarders Tahoe Donner has a snow play area, (within walking distance of the house) that offers tubing and sledding. And don't forget about trying the trails for snow-shoeing too! Want to warm up...try a winter swim in the outdoor pool at 80' water temp, or a spa at 95'...regardless of the outside temperatures! Be sure to check out all the Tahoe Donner amenities at the Tahoe Donner website. In summer you can play tennis, bike, hike, fish, canoe, kayak, sail, or swim in one of Tahoe Donners three pools or take a beach day at Tahoe or Donner lake, golf at one of the areas many courses, take a trail ride on horseback, or just bask in the sun off the back or front deck and bird watch! Still wanting for more? How about a work out in the gym, an afternoon sauna, a relaxing massage, or a trip to the spa? One thing is for sure, you'll have plenty to do and lots of choices too! and famous casinos. Beautiful Lake Tahoe is a 30 minute drive. National Wildlife Federation Organization as a recognized wildlife habitat area.